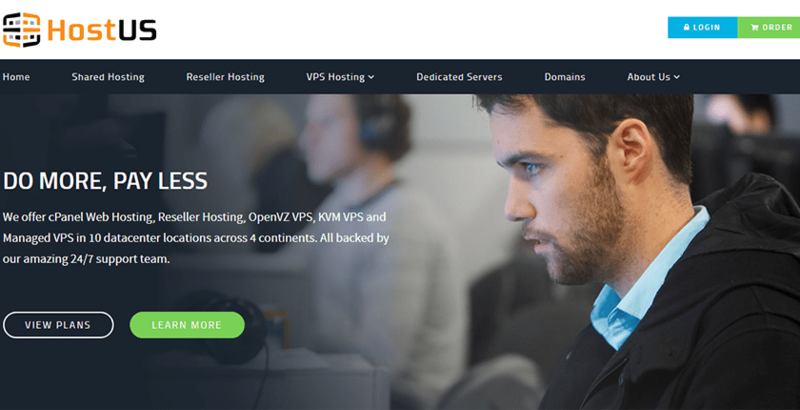 Hostus Review 2019: Is Hostus a Good Hosting? HostUS is a low-cost provider that is suitable for most basic to intermediate sites. Their service does lack many advanced features included by other providers, and their customer support appears to be somewhat lacking. HostUS is a U.S.-based company that has been offering low-cost web hosting since 2012. While they don’t provide a huge number value-added services, their plans are great for simple websites and many small businesses. The two things I like about HostUS is that they offer free migrations and free SSL certificates. Some hosts charge you additional fees to migrate sites or expect you to migrate on your own. SSL Certificates are vital for web security and required for webstores. Most companies charge additional fees for SSL Certificates or only offer a single certificate for an entire plan. To attract a wide variety of webmasters, HostUS makes it relatively easy to set up a site. You can choose to use Softaculous for one-click installs for WordPress and other CMS applications, or you can set up your site using cPanel and FTP uploads. More advanced users will appreciate support for Perl and PHP, but certain other frameworks such as Ruby on Rails do not appear to be supported. The Starter plan should be sufficient if you only need to host a single site. Otherwise, you might run into storage or bandwidth issues. You could make the same argument for all plans. If you plan on hosting a large number of sites that require high storage, this plan may not be for you. If you’re going to sign up with HostUS, it is advisable to choose Premium or better. The difference in cost between Starter and Premium is minimal. You could choose Executive for less than you’d pay for comparable service to other hosts. Note that HostUS does not have a very long money-back guarantee. You only have three days to discover if the service is right for you. I wasn’t very impressed with HostUS’ customer support. It appears that the only way you can reach support is via a ticketing system, and you cannot submit a technical question unless you have a hosting account. They do offer a knowledge base, but it is very basic. There’s little in the way of advanced support topics. When looking at some customer reports about HostUS, it appears that your mileage may vary. Some praise the support while others say “you get what you pay for,” mentioning that you shouldn’t expect much from their low-cost hosting. If you’re looking for a web host offering robust features and the capability to support any size website, HostUS is not for you. However, if you need a basic low-cost provider for small to intermediate sites, then HostUS is worth considering. Wondering how Hostus stacks up against other Web Hosting companies? Enter any other Web Hosting company and we will give you a side-by-side comparison.